The Corporate Work Study Program is a core component of the Cristo Rey Network model, allowing each student to work five full days a month in a corporate work setting, in addition to carrying a full load of classes. Emory Healthcare and Emory's Woodruff Health Sciences Center administration have joined 70 other sponsors of the Corporate Work Study Program at Cristo Rey Atlanta Jesuit High School for the 2015-16 school year. This program connects 278 ninth and 10th grade students with corporate jobs, and eight students will be working part-time at Emory Saint Joseph's Hospital, Emory University Hospital Midtown and Woodruff Health Sciences administration while also attending classes at Cristo Rey, located in Midtown. Cristo Rey Atlanta opened in August 2014 with 140 students in its inaugural ninth grade class, and is a part of the nationwide Cristo Rey Network that provides a rigorous Catholic college preparatory high school education to students of all faiths with limited economic means. The Corporate Work Study Program is a core component of the Cristo Rey Network model, allowing each student to work five full days a month in a corporate work setting, in addition to carrying a full load of classes. Earnings from the program pay for the majority of students' education costs, and students also gain invaluable experience and mentorship by college-educated adults. 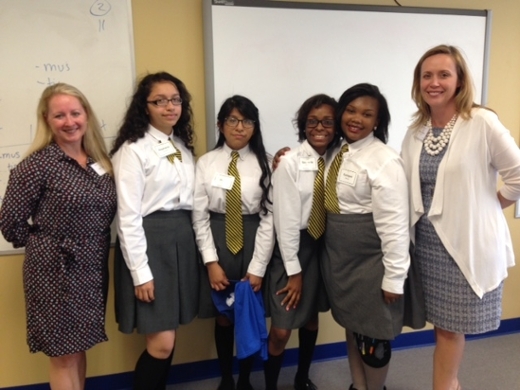 "We are excited to once again partner with Cristo Rey, because this is a great opportunity for their students to learn about the health care industry and see the job possibilities that are available to them. Cristo Rey's mission of providing a college preparatory education to young people with limited financial resources and educational options is closely aligned with Emory Saint Joseph's mission of providing for those less fortunate. Our continued partnership with Cristo Rey allows us to continue building the future workforce of health care," says Jeanne Landry, vice president of human resources at Emory Saint Joseph's Hospital. For the second year in a row, students Gabrielle Wilson and Eunique Banner are returning to share an entry-level job at Emory Saint Joseph's Hospital, while Hannah Kassa and Diana Garcia are job-sharing at Emory University Hospital Midtown. Woodruff Health Sciences Center administration is a first-time corporate sponsor, and students Joyou's Ingram, Aliyah Crawford, Clarence Boone III and Sandrine Noumadji will work in the real estate and research division. Since early August, the students have participated in sessions at the school's own Business Training Institute (BTI) in preparation for their upcoming business placement. "Last year was an exciting first year for us, our students and our 41 corporate partners," said Bill Garrett, president of Cristo Rey. "The companies were impressed with the caliber of commitment and dedication our students showed. Our students received valuable life lessons that simply cannot be replicated in the classroom."